Congratulations to everyone that submitted to the jam! All the games/music/art are so fun, and we hope everyone gets a chance to look at each one. Thanks so much again for participating ♡. 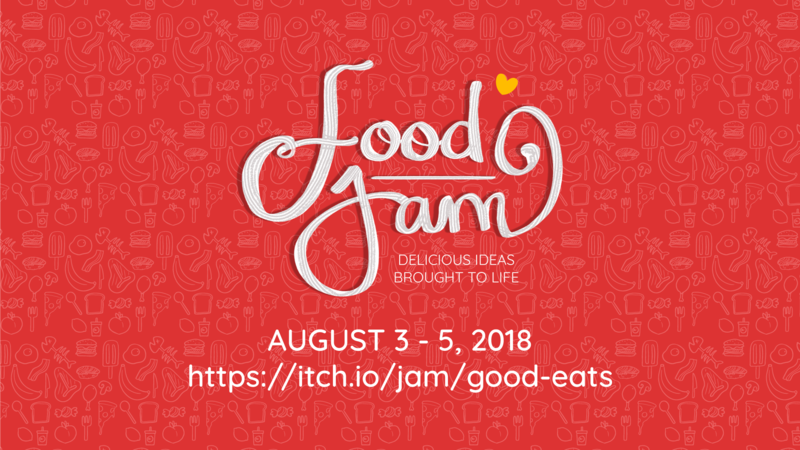 Food Jam is a jam where you make games/art/concepts/music based on food! The (sub) themed will be announced in an email blast, on Discord, and on the itch.io page on Friday, August 3rd at 12AM CST! Make a game (or just some art or something!) by yourself or with friends, but make sure the work is yours! You can make pretty much anything as long as it adheres to the theme, but an actual playable prototype is super fun and good. Jammers retain all rights to their work, and you can find a handy list of general game jam tips here: link. Join the conversation on Discord: here! You can join or create a team on Crowdforge: here. Edit 7/28/18: Due to some scheduling conflicts and confusion, the jam is being pushed back a week! Sorry for the inconvenience. The new dates are August 3-5. Edit 8/6/18: Jam entries should be made within the time limit of the jam in order to both be fair to other participants and to really enjoy the experience of what a jam should be. For this reason, I have removed submissions that were made before the jam start date. There is only one true way to measure your power: Girth. Battle your friends to become the mightiest, fullest wizard. Battle against your friend to get the biggest buffet. Help clean up after the buffet! Three heroes are chosen to find the cause of the blight at The American Buffet. Dive into an adventure, where you have to collect an incredibly delicious pie! I can't code at all, so enjoy this minimally interactive cake display.